Rosalie Muirhead stands in front of her quilt at the 98th Annual Weld County Fair. 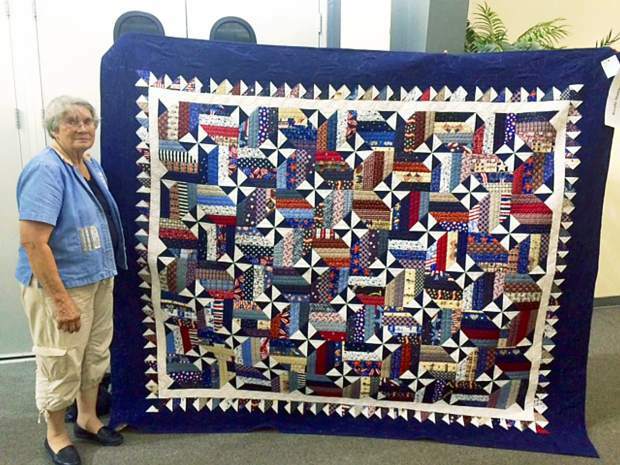 She entered her patriotic-themed quilt in the quilting competition on Saturday morning. Quilt competition judges Pamela Walsh, left, and Chris Brown examine a quilt during Open Class Quilt Judging at the 98th Annual Weld County Fair at Island Grove Event Center, in Greeley. Quilt Competition judge Pamela Walsh examines a quilt during Open Class Quilt Judging at the 98th Annual Weld County Fair at Island Grove Event Center, in Greeley. With more than 30 years of experience and too many quilts to count now under her belt, she said quilting quickly became her favorite pastime. 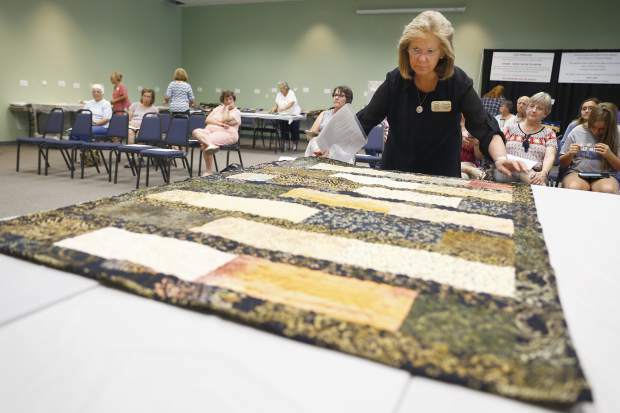 This is the third time she entered the quilting competition at the 98th Annual Weld County Fair, located at the Island Grove Regional Park Event Center. 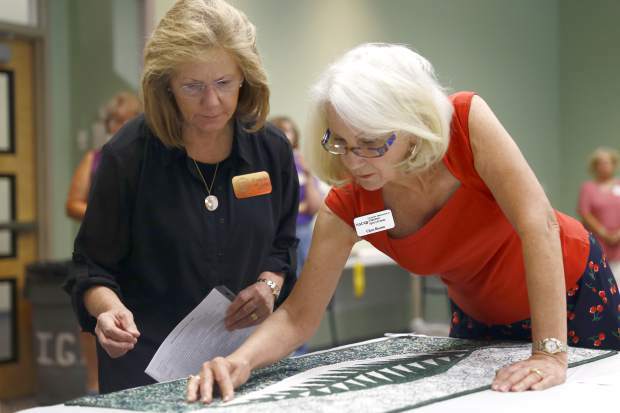 Quilters from across Weld County entered their best-stitched pieces into the competition the morning of July 23. Their quilts were closely examined and assessed by judges Pamela Walsh and Chris Brown. The women would flip the quilts in each and every direction, then examine them up close — noses almost touching the stitching — then again from afar. Awards were given for places 1-5 for each quilt category and age group, although a first place award doesn’t have to be given out if the judges don’t deem a quilt worthy. 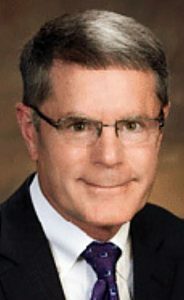 From there, an overall award is given to a champion and runner-up, and these winners can be from any category or any age group. 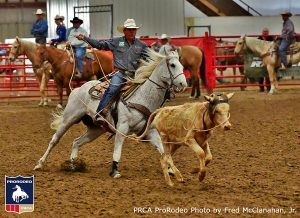 Muirhead was not an overall champion Saturday, but she said she didn’t necessarily enter the competition to win. She likes getting feedback and critiques of her quilts because it helps her improve for future quilts. She designs quilts for everyone: friends, family members, her church and veterans. The quilt she entered in this year’s competition even had a patriotic theme of red, white and blue. “To me, a quilt is warmth and love and is a way to express that to someone we might not even know,” she said. Muirhead said quilting is her outlet of relaxation. She makes anything from baby quilts up to king-sized quilts, which are typically anywhere from 102-120 square inches. But her favorite feeling? Putting the last few stitches into a quilt she has been working on.